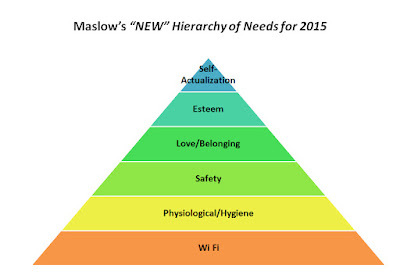 In his seminal work A Theory of Human Motivation, Abraham Maslow introduced the world to his model depicting the hierarchy of needs required by humans. However, after substantial analysis, re-analysis, and re-re-analysis a new foundational layer has been added to his model that is even more fundamental than a human's basic need for physiological elements such as air, water, etc. So, the next time you are surrounded by groups of humans you will almost always see them searching for the fundamental requirement of life....Wi Fi!